As training camp progresses, Arizona Coyotes’ coach Dave Tippett is looking for players on the bubble to step forward and create separation. That’s true for younger players hoping to make this team. 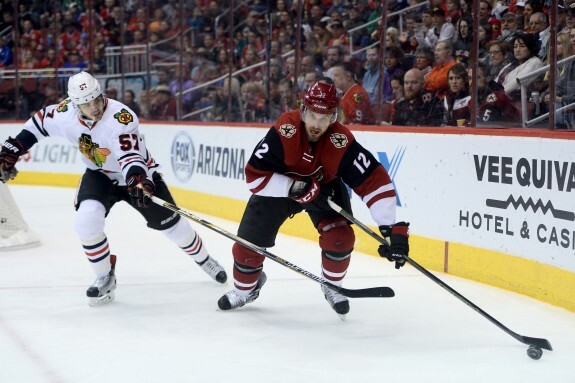 Following a plethora of offseason changes, there could be a few roster spots up for grabs, and that’s especially exact for a winger looking for a job on the Coyotes’ third and fourth line. Tippett was speaking of the rookies’ effort against the Kings and used Bunting as a microcosm for battles on this team. Here at the advent of camp, Bunting is vying for attention and in competition with other left wings, including Christian Dvorak, Brendan Perlini, Lawson Crouse and Laurent Dauphin for likely one spot on the team. In Monday’s game, Tippett had Bunting on the left wing, with Ryan White in the middle and veteran Brad Richardson on the right wing. All worked well, but Bunting knows the road ahead to make this team is filled with land mines and road blocks. At this point, Bunting is not flashy from an offensive vantage and his size, at 5 foot 11 and 197 pounds, represents no red wood in front of the net. Still, his grit and ability to be at the right place at the right time could gather attention. As the coach, Tippett was not blinded by the Coyotes’ opening preseason triumph. Admitting “everyone likes to win,” he dismissed the victory as only the opening contest in what he refers to as a continuing audition for younger players. At the same time, the Coyotes lost to the Kings, 4-3, in the other half of the split-squad to the Kings at the Staples Center. After the summer vacation, players were eager to get back on the ice. One, in particular, was defenseman Luke Schenn, who had a history with coach Tippett. Schenn played for Team Canada in the 2009 World Championships, and Tippett was an assistant coach. In the game against the Kings at the Gila River Arena, Schenn picked up the first goal of the game on the power play midway through the opening period. For his effort, Schenn played 22 minutes, 12 seconds, and tied defenseman Justin Mache with four hits, which was most on the team.